This week on The Goldmine we will be giving Led Zeppelin’s Houses of the Holy a listen to. 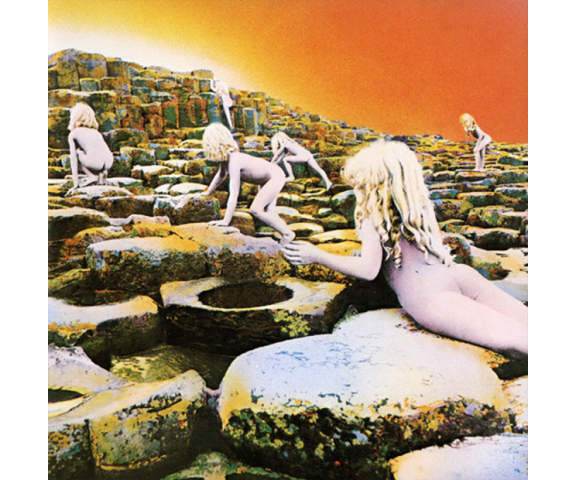 Released in 1973, Houses of the Holy was the follow up to Zeppelin’s hugely popular untitled fourth album. The album was a musical turning point for the band, who explored a growing number of sounds that added greatly to the diversity in their music. Houses of the Holy is a wonderful mix of many popular musical styles, with the fantastic talent of its collective musicians to hold it all together. The albums starts off with a bang in the form of The Song Remains the Same. Guitarist Jimmy Page plays overdubbed 12-string guitars ferociously, the song (along with Achilles Last Stand on the Presence album) is the best realization of Page’s dream of a symphony-like guitar army completed through multiple overdubs. With both the 12-string and Robert Plant’s slightly sped up vocal performance the song is in a much higher tonal register than much of Led Zeppelin’s work. The Song Remains the Same became a concert staple and lent its name to Led Zeppelin’s concert film released in 1976. Following up The Song Remains the Same is The Rain Song. The quintessential rock ballad, The Rain Song is allegedly inspired by George Harrison of The Beatles, who at a concert told the band that they should write more ballads. The song has multinstumentalist extraordinaire John Paul Jones on his traditional bass as well as piano and mellotron, giving the song its lush string orchestral backing sound. Vocalist Robert Plant used The Rain Song during his fantasy sequence in the aforementioned film The Song Remains the Same, which had all band members and manager Peter Grant playing out dreamlike short stories. At 7 and a half minutes, it’s the longest song on the album. The third song on the album is Over the Hills and Far Away. Another ballad-like song, this time Jimmy Page gets back to his 6-string with both electric and acoustic overdubs and an extended outro. It was released as the single to promote the record backed by Dancing Days as the B-Side. Over the Hills and Far Away, like The Song Remains the Same, became a concert staple and a popular radio hit. It is one of the best examples of Led Zeppelin’s acoustically styled writings brought forth from Plant and Page’s vacations at Bron-Yr-Aur in the Welsh mountains. The last song on the first side is The Crunge, a James Brown styled funky jam. A short and comparatively trivial song when held next to the first three songs on the album, The Crunge was derided by critics early when the album was released as more of a joke. However, the song was a band favorite even though they never played it live and one of the most lighthearted songs on a very fun and lighthearted album. The second side starts off with Dancing Days, another fun song with light, if not a little quirky lyrics. Dancing Days could be considered the most generic song on the album, a mid-tempo rocker with some interesting guitar and organ melodies. While it’s the closest thing to filler on the album, you can hear it on the radio all over still, which is a testament to the strength of the songs on the record. The second song on the second side is D’yer Mak’er, which was also the second single released on the album. It’s pronounced “D’jer Make-er” after a joke with a punchline mimicking the pronunciation of Jamaica with an accent. The song was written in reggae/dub style and is credited to all band members. Along with The Crunge, D’yer Mak’er is one of the songs singled out by critics and fans as more disposable because it didn’t fit Zeppelin’s ‘sound.’ Nevertheless, the track is very catchy and all band members give it their best. Following this up in the complete opposite musical spectrum is No Quarter. A moody and murky piece, the song features Page’s guitar playing one of his heaviest and dirtiest riffs and one of his most melodic and subtle guitar solos of his storied career. But No Quarter really belongs to John Paul Jones, whose keyboard expertise on synthesizer and piano truly makes the song great. It was his ‘dream sequence’ song in The Song Remains the Same. Stop me if you’ve heard it before but No Quarter became a live staple, featuring Jones playing extended keyboard solos stretching the 7 minute song to an epic 20 plus minutes. From drummer John Bonham’s countdown to start the song to the very end of the feedback fading out The Ocean is everything an album closing song should be. The track is four and a half minutes of unbridled joy, dedicated to the band’s legions of fans who looked like an ocean when viewed from the stage. Robert Plant’s vocal performance saunters along with Page’s raunchy guitar riff and we can’t forget the Bonham/Jones backbeat that swaggers behind everything. The Ocean’s doo-wop coda brings the song and the album to a thrilling finale to close the album. Houses of the Holy crams a lot into 8 songs on a single album. Each track is wildly different from the last and shows a much more multifaceted face of an already diverse band. Led Zeppelin never wrote a more varied single album. Their next release, the sprawling double album Physical Graffiti, would see them follow this path of making a wide array of great sounding rock (spectrum) music. Most albums are unified by tones and sounds or lyrical and musical themes, Houses of the Holy is unified by the presence of four supremely talented musicians as they enjoy creating a wild and fun album.